The Fellowship was fortunate enough to obtain a copy of KING: JUNGLE JIM #1 from Dynamite Entertainment. The story is written by Paul Tobin, illustrated and colored by Sandy Jarrell, and lettered by Marshall Dillon. It seems that the planet Aboria itself is rebelling against the forces of Ming. Plant, insect, and animal life are attacking the slavers; some believe it is the work of the mythical Jungle Jim. Prince Baron sends Thun and Kugor to help Lille Devrille find Jim in an effort to free her brother. Along their journey, they observe incredible events that defy explanation involving the jungle life. Is this the work of this “Jungle Jim?” If he does exist, can he be found and aid Lille’s brother? 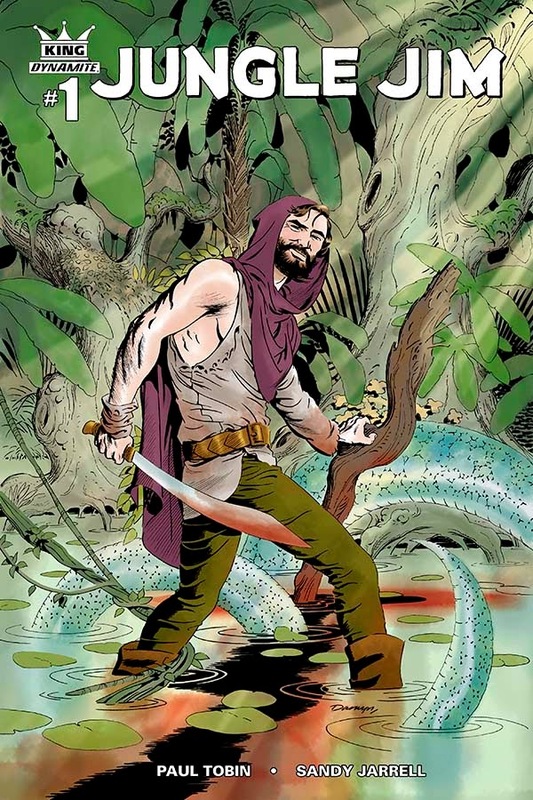 KING: JUNGLE JIM #1 is in stores now, or available for ordering at www.dynamite.com.